I know what she’s thinking: is that it? Or are they going to, like, light this on fire to cook the actual main course? A demonstration is in order. Brandishing a pair of chopsticks in my right hand, I gingerly lift the plastic several inches upward with my left, leaving behind a messy string of viscosity that oozes all the way from the plastic, sinking back into the tray. The pungent scent is inescapable, like something you’d encounter accidentally in transit. I stab what’s inside with the sticks and twist my wrist clockwise several turns. Before the Venus can say a word, I press the smelly, sizable glob through her parted lips. Languid chewing, then silence. As her cheeks swell, the goo slimes its way down her lips, nestling off her chin. In other words, it looks like she’s suffering from a nasty cold as opposed to enjoying one of my all-time favorite delicacies. So goes my experiences with natto, a traditional Japanese food made from fermented soybeans that most of its countrymen and women would choose not to consume if their lives depended on it. This is partly due to its reputation as “healthy,” but more about its inimitable appearance. After years of wondering what this bête noire called natto was like, my curiosity was rewarded within the first week of my arrival in Kobe as a university exchange student. Enjoying breakfast with my host family one morning, I polished off the familiar—cereal, toast, eggs, sausage and salad—but then, something curious was plopped down before me on a bed of rice. It didn’t look good (and in the ken of Japanese cuisine, this is really saying something), and we’ve already covered the smell, but there was something about its taste that hooked me instantly and hasn’t let go. Even today, I’m challenged to describe what natto tastes like, since it bears no resemblance to raw or cooked soybeans, and doesn’t bear the flavor of anything else that’s edible through fermentation. Back then I likened it to edible paste, or a nutty mucous. If it ain’t broke, indeed. Something else: natto has now become the ultimate litmus test for gauging my compatibility with a potential mate. 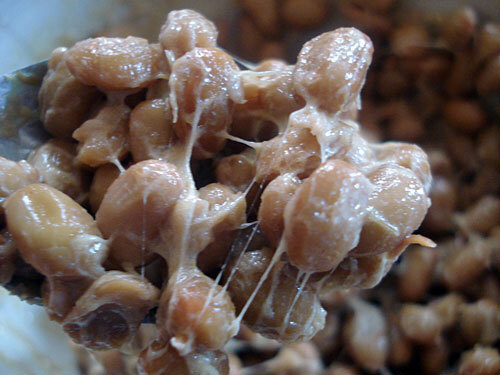 Forget horoscopes and blood types, natto is the great equalizer. Without exaggeration, my relationships with Those Who Can Try It have lasted far longer than with Those Who Would Prefer Toejam, and this gains added weight for significant others (although even I’ve thought twice about sneaking a kiss after munching some). This is no coincidence. Like many acquired tastes, natto will not tumble neatly into a communal dining experience. It just can’t be shared. No, it must be savored solitarily, and what better time in young man’s life is there to enjoy something in private, away from prying eyes, than on the JET Programme? I’ve always wondered if part of my attachment to natto speaks to a deeper part of my psyche. The ultimate underdog food, it assaults nearly every sense of a Japanese. As a foreigner working in a big city but still living far beyond the fringes of the Sticky Rice Society given my unmistakably clashing background and appearance, natto and I bonded in a way that I never could have with my coworkers, or even the Drummania machine (another magnificent obsession). This was all the more remarkable after learning the Kansai region has far less passion for natto than their eastern neighbors. The irony that one of the most homogeneous societies on earth with a strong reputation for groupism could shun such a dish while leaving the door open for cadres of connoisseurs (both foreign and domestic) to beat the drum in its favor was not lost on me. A word about that. Legend says that Chairman Frank Sinatra was notoriously precise about the way he took his whiskey. A minimum of ice, and never mixed with water (the rationale being that he wanted a drink, not a bath). I’m the same when it comes to natto: give me the packet of mustard provided and I’m good to go. (Sauce? Pshaw!) I always made an effort to hunt down the no-frills, whole bean variety, and if I was in a particularly adventurous mood I would grate some cheddar cheese on top. You know, to keep things exciting. Happily, this tradition still continues today. Thanks to an Asian supermarket located tantalizingly close to home, my fridge is never without at least one full package of natto (even in New York, it’s happily inexpensive), and almost every morning I’m faced with the same decision: before or after cereal? Since returning from JET, I’ve read all about different combinations of natto streets ahead of anything I could have dreamed up on my own. Natto toast, fried natto and natto ice cream are all vittles I hope to try one day, and I’ve even taken the creativity of the old days one step further by whipping up new ways to prepare it for an eager audience of one. Natto omelet, anyone? My relationship with natto has been one of my greatest takeaways from living in Japan. Like keeping up with the culture itself, it’s provided me with a lifelong fascination, a new shade of tolerance and a respect for the unconventional, and I remain optimistic that I can convert more tyros to its elusive appeal. Looking back, it’s strange to think that even before I could grasp just what exactly it was, I was somehow expecting greatness from natto. What I got instead was transcendence.